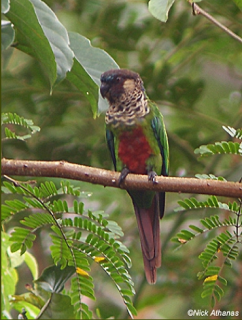 The Santarém Conure was historically listed as a subspecies in the Pyrrhura picta complex. P. a. amazonum: Both adults crown to nape dark brown; blue band in front of eyes; frons and face dark red/brown; brown-buff ear coverts; grey-green upper breast with grey-buff scalloping; lower breast yellow-buff with scalloping; green wing bend; brown-red patch in center of abdomen; brown-red tail with green at base. Bill grey-black. Eye orange-brown, with bare grey eye ring. P. a. microtera: Both adults narrow frons, darker red/brown, upper breast dusty brown with grey-buff scalloping. Smaller in size. P. a. amazonum: Juveniles duller than adults. Fine grey-white scalloping on breast. Brown-red patch less extensive on abdomen. Tail shorter. Eye-ring grey-white. Calls made in flight described as coarse, rough and forceful; less harsh than that of other Pyrhurra sp. Appendix II, as congener with P. picta. The primary threat to this species is accelerating deforestation in the Amazon basin as land is cleared for cattle ranching and soy production. It is also susceptible to trapping for trade. E Amazonia in northern Brazil, along the north bank of the Amazon River from Obidos to Monte Alegre in Pará. On the south bank from Santarém, Pará east to Imperatriz, Maranhão. South to Mato Grasso. Found up to 600m (1968 ft) in wooded habitats including terra firme and dry deciduous forests. Food items include fruits, flowers, seeds and probably insects and their larvae. Goupia glabra and Trema micrantha fruits are taken, as well as Bagassa guianensis and Euterpe fruits. Found in flocks of 5 to 12 birds. During breeding season seen in pairs and families. Flight is swift and direct. Birds visit watercourses each day to bathe, and have been seen bathing in spray from a nearby waterfall. 5-7 elliptical eggs, 26.5 x 19.0mm (1 x 0.7 in).